If there is anything to justify the53's continuation as a complete TD it's the fact that it still has the original engine: . A cursory glance says that things aren't all original. 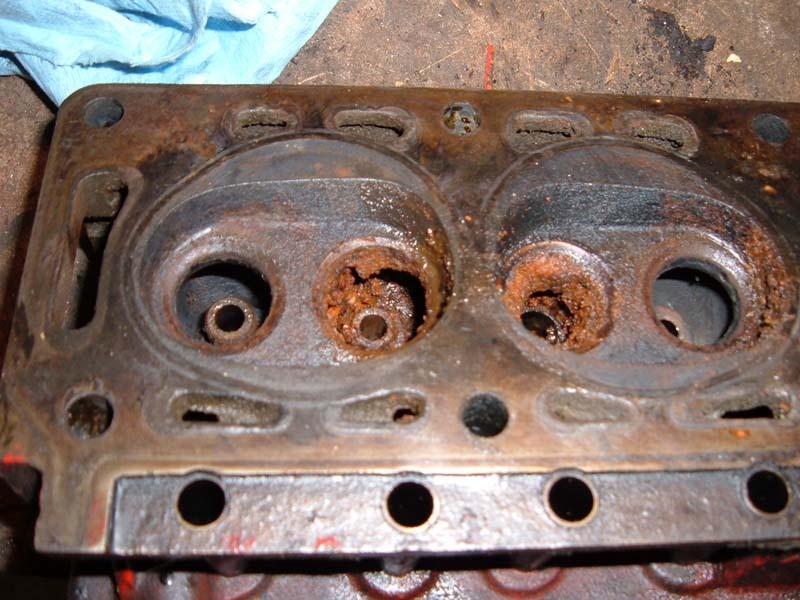 For example, the head is from an early banana port engine and the sump is of the same vintage. 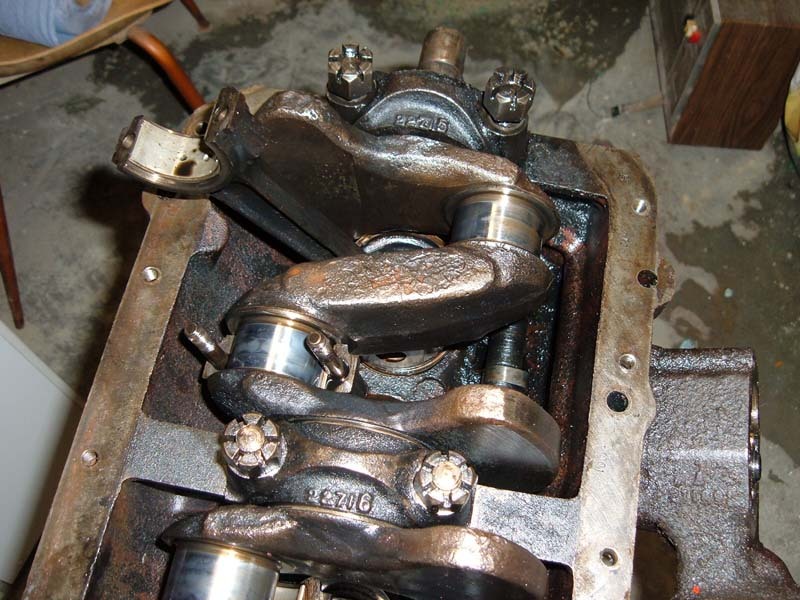 The engine can be turned over by means of the crank. That's about the end of the good things. But it cleaned up reasonably . Magnafluxing showed no cracks. A bit of machining, some new valves, seats and guides might make it useable.
. Okay, let's have a look at the bottom end . No evidence of of rust problems. I pulled the main caps and did some testing with plastigage to get an idea of how much wear there might be: & = . Shucks, .002" isn't all that bad. I haven't yet measured to see if the crank journals have been machined. 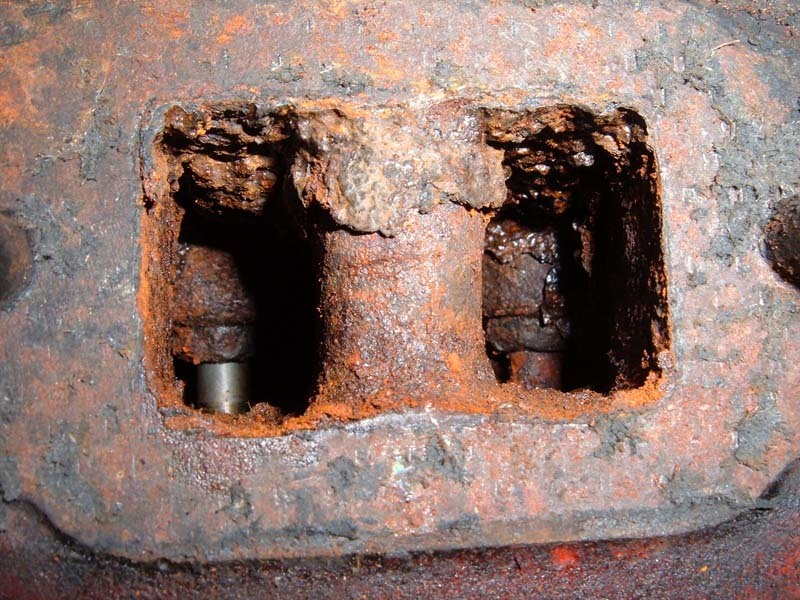 The center and rear mains showed similar results. Something funny showed up when I went to do a plastigage test of #1 rod journal -- there are no cotter pins in the rod cap bolts. 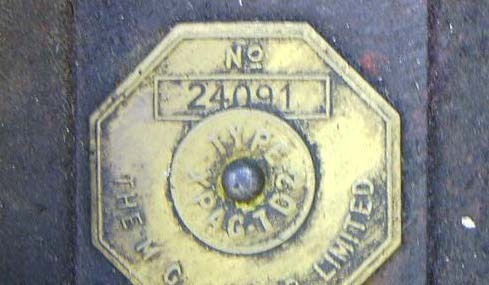 Before you ask -- they are not nylock nuts. The nuts were highly torqued down. It took a lot of oomph to loosen them. On the contrary, the main cap nuts, though cotter pinned, could almost be loosened by hand. A butcher had obviously been at the engine. 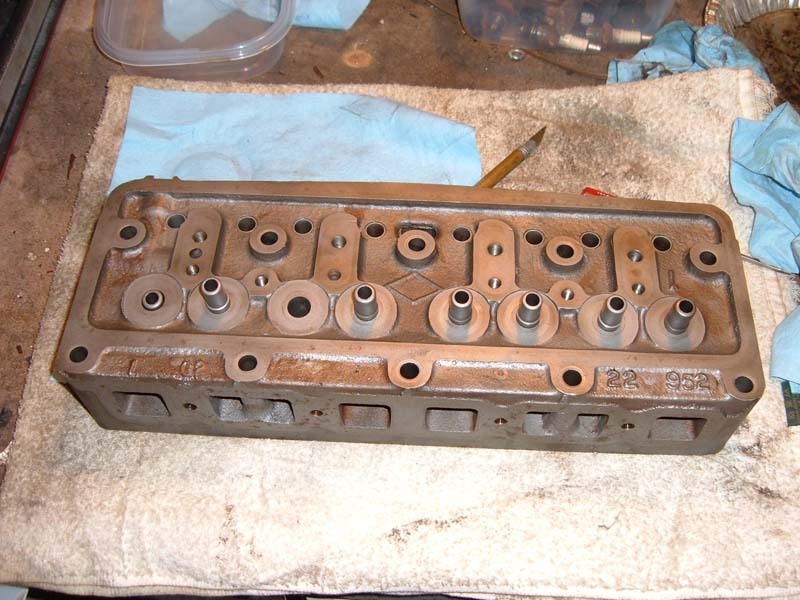 I removed the bearing caps and lifted the crank out of the journals to pull the pistons. 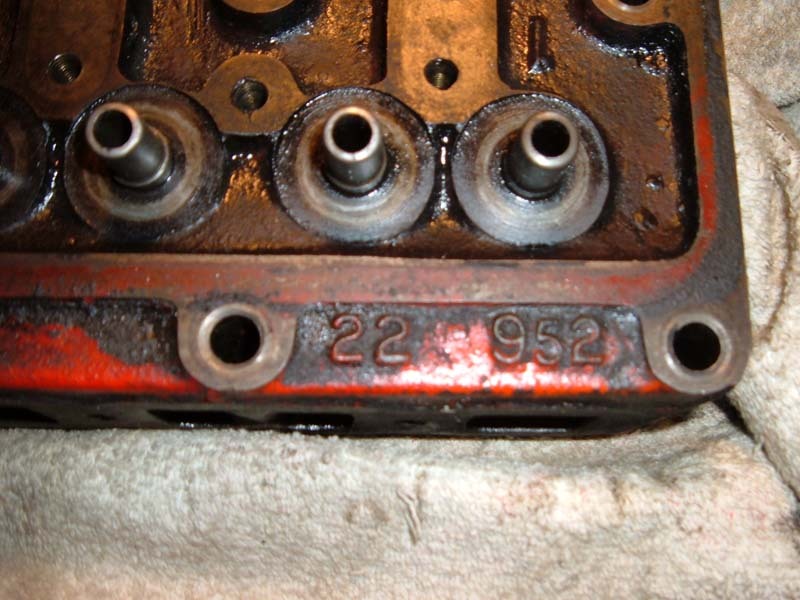 Pulling #1 showed that the engine has 4 ring pistons that are +.030" oversize . 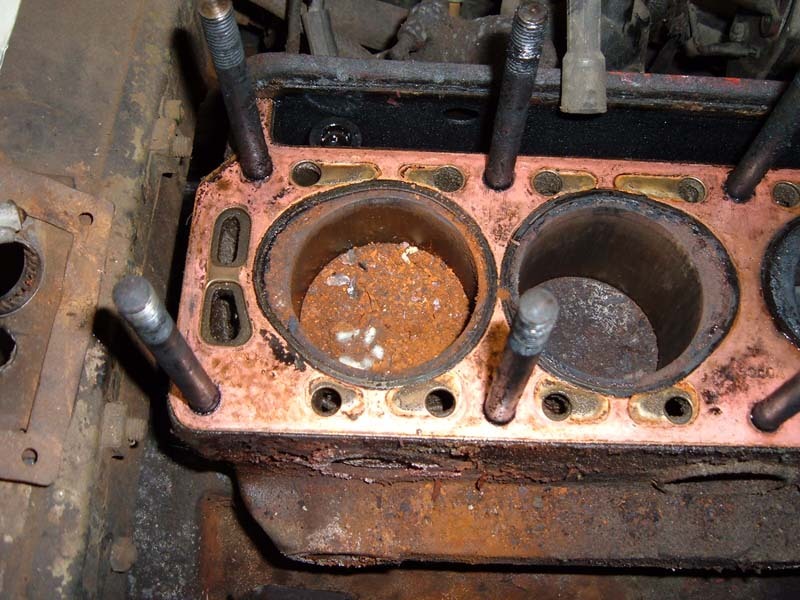 The disaster showed up when I removed piston #2. 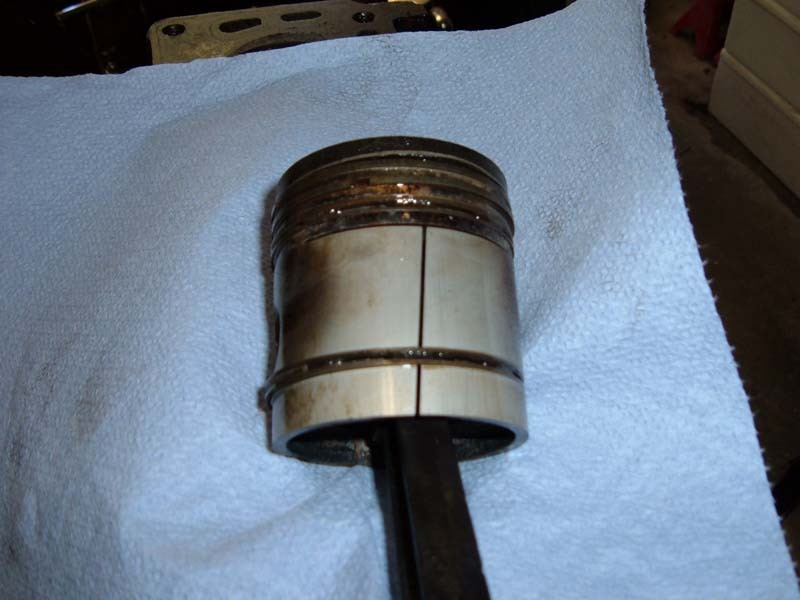 The wrist pin was loose on the rod and could slip out of the piston. The pinchbolt wasn't clamping the wrist pin . Some of the thread is gone from the bolt . It took a lot of effort to remove the pinchbolt. 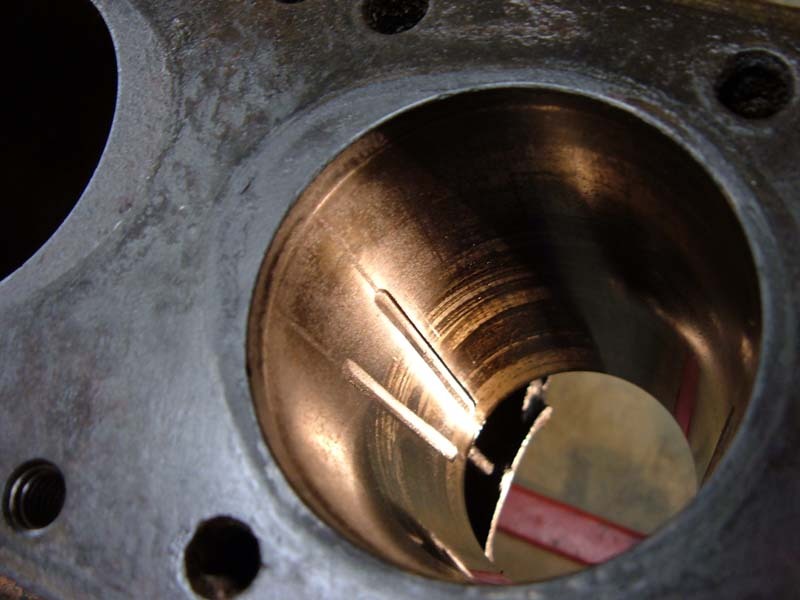 The effect of this was to allow the wrist pin to slide all the way through the piston and contact the cylinder wall. 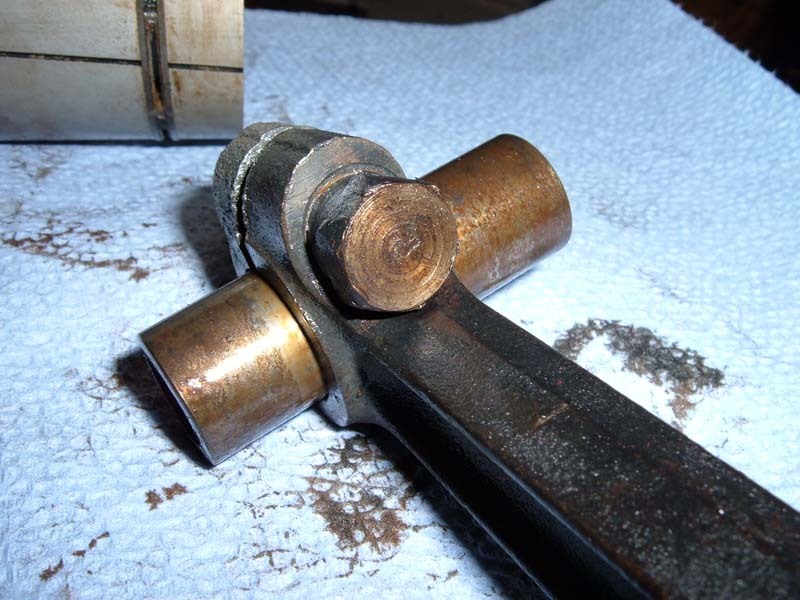 The ends of the pin gouged channels into the cylinder wall : & . 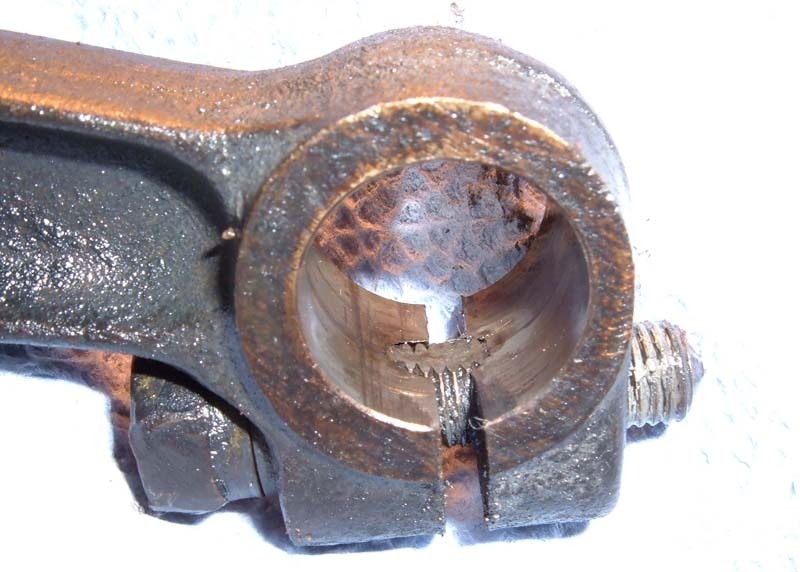 There are similar gouges on the forward wall of the cylinder. It's hard to measure them, but they seem to be about .010" deep. Now I can guess why the car was taken off of the road 36 years ago. 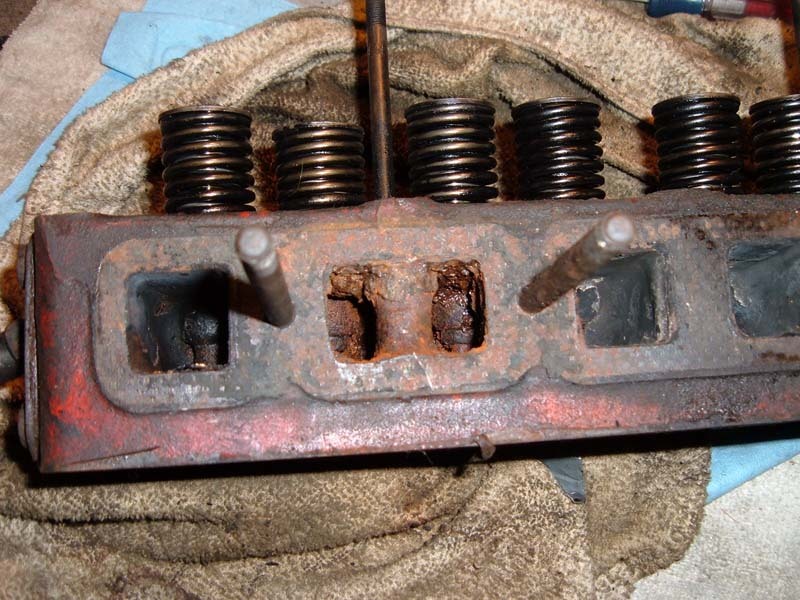 I'm guessing that this showed up shortly after having the engine rebuilt. Now the quandary - (if I'm going to save the engine, that is). Should I have a sleeve put into #2 and then have it bored to .030" over and reuse the pistons. 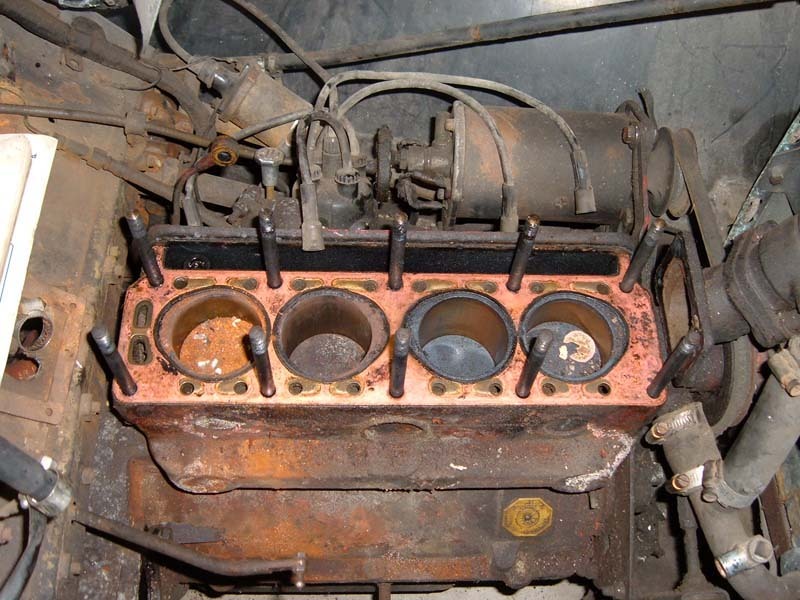 Or, should I have #2 bored out to the next standard oversize that would clean up the gouges (maybe +.060") and then have all cylinders bored to that size and get a new set of pistons? I'm open to suggestions. Drop me a line. 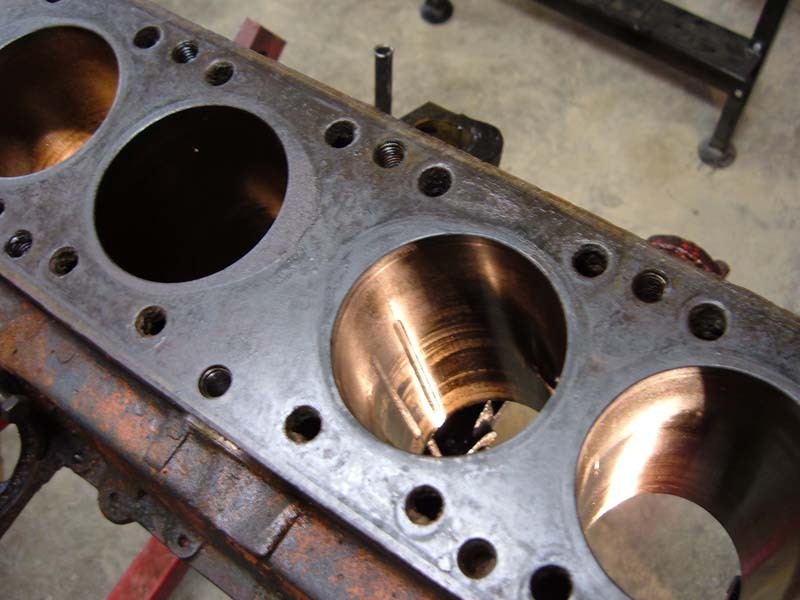 6/7/2011 --- FYI I was able to purchase a late head that I had redone with new large valves. Its thickness was about 2.95", about .070" less than standard. 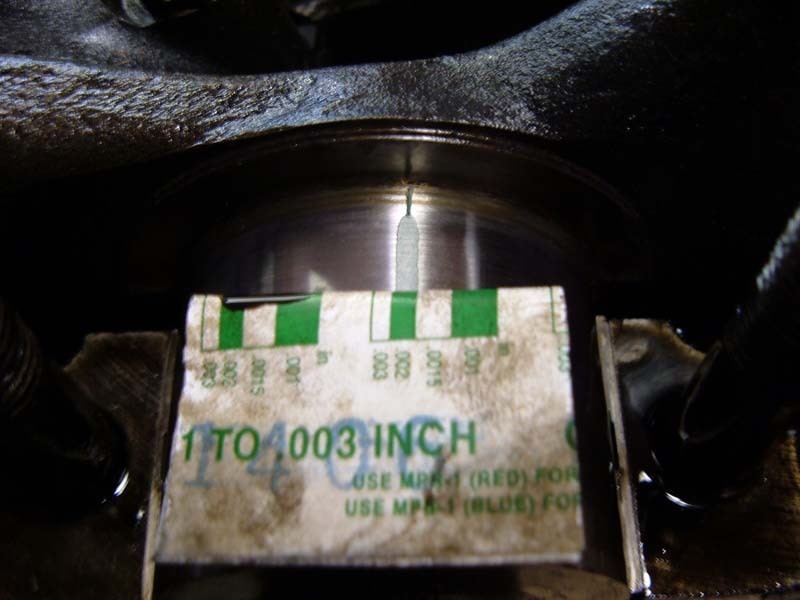 I had another .030" machined off to give a compression ratio of about 8.9:1. With the cylinders bored .040" over, the displacement is now about 1289 cc. 3/8/2013 --- Catching up .... 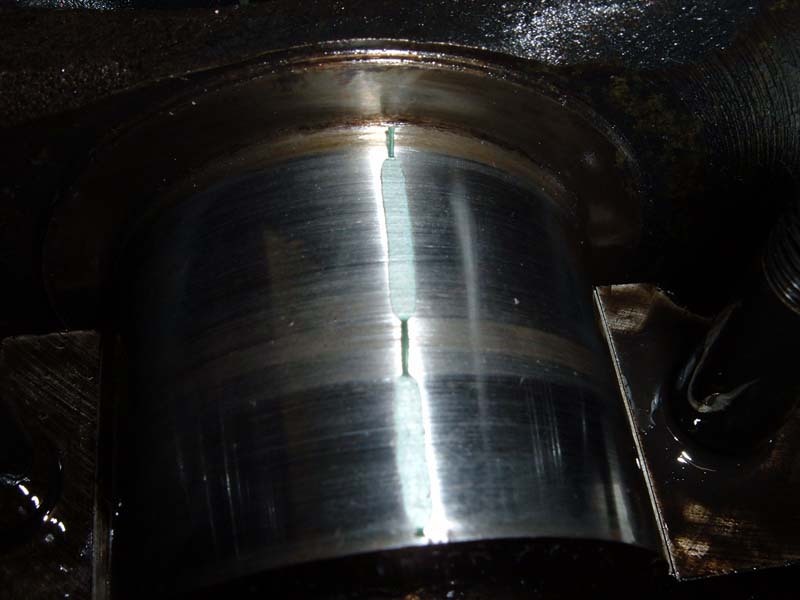 I had been giving thought to boring all cylinders .060" over and just buying new pistons. After talking about it with my machinist, Damian Sgarzi, I decided to just sleeve cylinder #2 and stick with the .030" over pistons. Mentioned this to my MG guru, Lawrie Alexander, and learned that he had a set of new .040" over pistons looking for a new home. So, cylinder #2 was sleeved, all cylinders were bored to .040" over and new pistons were installed. 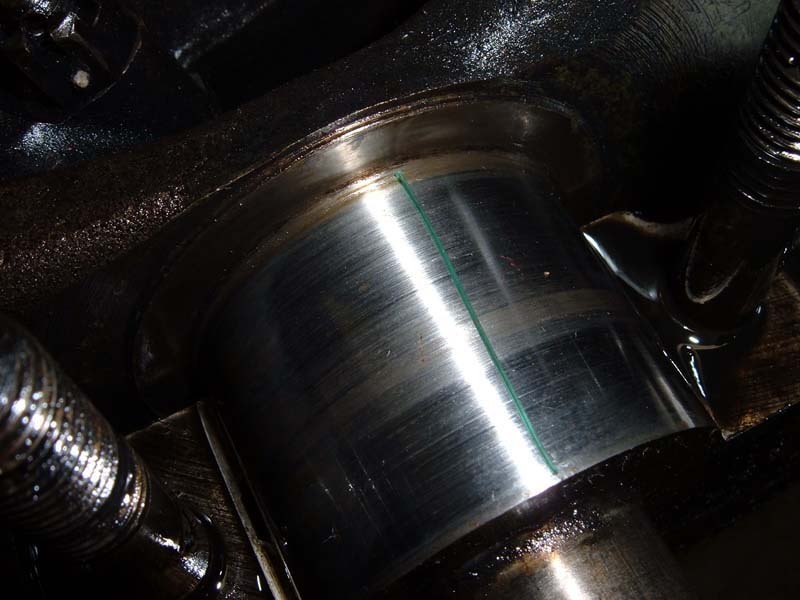 Measurements of the crankshaft journals confirmed that engine rebuilding had been done recently (mileage wise). The main journals measured between 2.0360 and 2.0375". Standard is 2.047", so this indicates that the mains were machined to .010" under. The rod journals measured between 1.752" and 1.753". Standard is 1.772", i.e., they are .020" under. All journals polished up very nicely. This explains the .002" readings from the Plastigage tests. May 17, 2013 -- Have finally had the chance to put some miles on the engine. Wow!! Very peppy. Today I replaced the ancient 40 year old exhaust system with a Bell stainless steel system. What a great sound. I only have about 100 miles on the engine, so it's still in the break-in stage as far as the new pistons/rings/bores are concerned. It responds very well to the occasional goose of the loud pedal. Much better since I tightened up the rear axle u-bolts. Oil pressure is great, idles around 40 psi, warm. It feels strange to be driving a TD with the stock 5.125:1 rear end. I'm so used to Lazarus with the 4.3:1.